Parenting isn’t easy. Even when your kids are “yours,” it’s not an easy task. Imagine if your child sprang up from your garden, full grown. It would be even harder. Walt Disney Pictures’ new film The Odd Life of Timothy Green is a beautifully-filmed and well-acted reflection on what it means–and what it takes–to be a parent, and ultimately, what makes a family. Ask anyone who has kids, and they will tell you it’s a lot more work than you expect, and you will only make new mistakes as you go along the journey. In the film, a childless couple (played by Jennifer Garner and Joel Edgerton, in two very engaging performances), is given the news that there is literally nothing else they can do to have a child of their own. In one last night of wishful thinking, before they close the book on that part of their lives, they write down all the things they want their child to be: a good heart, that he will rock, that she will score the winning goal, that he will love and be loved. They put these wishes in a box and bury it in the garden. That night, Timothy appears, covered in mud, claiming to be their child. Oh, and he has leaves growing out of his ankles. Every one of the things in their list is personified in this boy, and each trait affects the other characters in the film in a positive way. Each leaf on his leg represents one of those traits–and every time one of those traits manifests itself (a sense of humor like Uncle Bub, for example), a leaf falls. Timothy is clearly a seasonal soul, and he realizes that time is of the essence. Timothy Green is directed by Peter Hedges (What’s Eating Gilbert Grape and Dan in Real Life), who avoids those overly sugary or saccharine moments that affect most family dramas, especially ones where someone shows up to affect everyone’s life for the good. It helps that the film gives you a reason to care about the characters, especially in the opening scenes which set up the Green’s story. The sentiment builds naturally, leaving the film’s climactic scene–even though you can sense it coming–to be quite touching and real. It’s a genuine film that really does like its characters, and engages the audience in liking them as well. Like the great family movies Walt Disney used to create, The Odd Life of Timothy Green, is a film that both adults and children will like–and parents will especially find the film satisfying on many levels. My own children (ages 6, 11, and 13) all liked Timothy’s character, and CJ Adams plays him with a wide-eyed, friendly innocence. But as a parent, I connected with the film on a deeper level as Cindy and Jim Green struggle with being thrust into parenthood without any preparation–which happens to every parent–and struggle with how many mistakes they make dealing with bullies, first love, being different, and all the rest of the things every kid must face. The story, by Ahmet Zappa, with a script by Peter Hedges, is uniformly excellent. From the opening framing device of Jim and Cindy telling their story to an official at the adoption agency, to the broadening of the story to include the couple’s struggles with work and family (absentee fathers and over-performing sisters), the dialogue rings true. An especially good scene is when trouble at work affects the family dinner, eventually causing an impromptu picnic in the living room–leading to a new vision for the town’s primary economic activity: pencil making. Both Garner and Edgerton deliver excellent performances, moving from sorrow to jubilation with endearing realism. Both actors bring a lot of depth to the couple, and their genuine joy they portray in the discovery of what they are learning as parents is heartwarming. Dianne Wiest is wonderful as a cranky member of the pencil-making dynasty, and M. Emmet Walsh is once again reliably both crotchety and smiley as Uncle Bub. The real star is CJ Adams, who is only making his second film appearance (after Dan in Real Life). He is a cute and likable kid, and although his role is only there to affect those around him for good, he brings a sweetness that makes you root (no pun intended) for Timothy from his first appearance, all the way to the inevitable climax. The score by Geof Zanelli is delightfully magical, with a good dose of country folksiness, only adding to the beauty of the Georgia landscape, where the film was shot. The film is full of color and makes the most of the late summer, early fall south’s abundance of beautiful trees. The rest of the supporting cast does a great job as well, but it’s really Garner, Edgerton, and Adams’ film–and they help make this a perfect family film to end the summer. 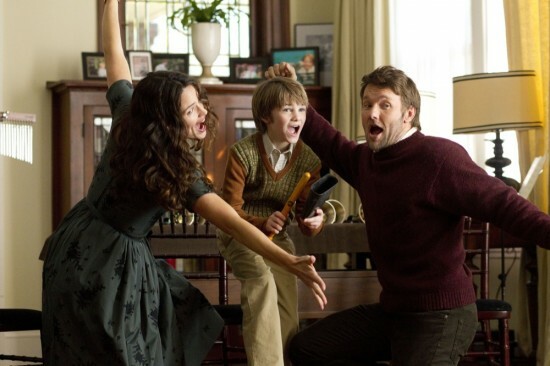 The Odd Life of Timothy Green is a beautiful celebration of parenthood and discovering what it takes to be a family.